﻿ focusun tube ice machine- quality tube ice maker with lower price. Evaporator module: The evaporator and its accessories are installed on a steel frame which forms the evaporator module. When transporting, place the evaporator horizontally and stand it upright when installing. Compressor module: Compressor, condenser, reservoir, liquid receiver, oil separator, and electric control box are installed on a steel frame to form the whole set. 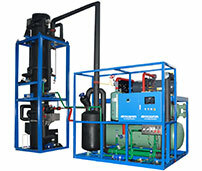 Cooling tower module: Cooling tower, water pump and water pipes. Standard power supply for the large capacity tube ice machine is 380V/3P/50Hz and it can be customized to meet different electrical requirements. Large capacity tube ice machine technical parameters. Standard condition: Dry ball temperature is 33℃ and water inlet tempetature is 20℃.